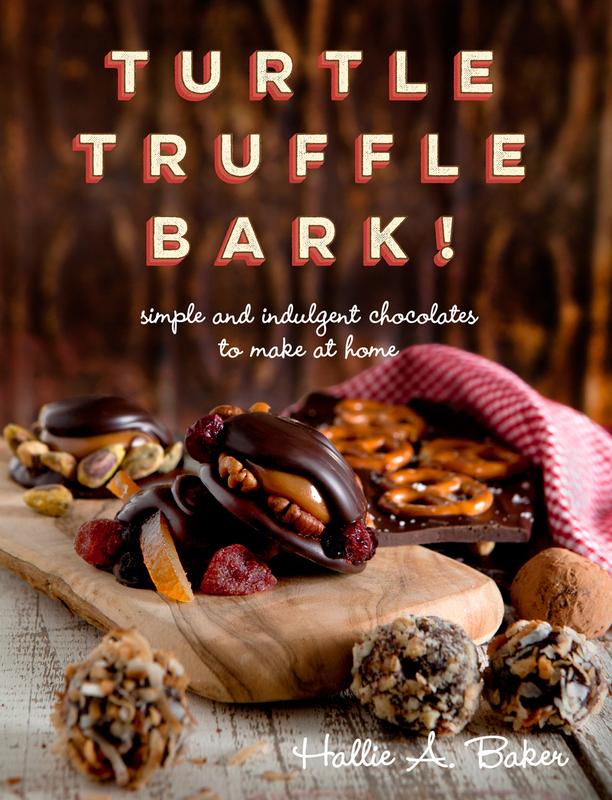 Even if you’ve never made chocolate candies before, you’ll fall in love with the easy recipes in Turtle, Truffle, Bark. The title refers to the three types of candies featured in this cookbook: A turtle is traditionally a pecan-studded, chocolate-covered caramel patty, but reimagined by author Hallie Baker, you'll be making Dark Chocolate Almond Chili Turtles and White Chocolate Cashew Mango Turtles. You might think you know what Baker means by a truffle, but think again. These aren’t everyday flavors—here are crazy-simple recipes for Milk Chocolate Lavender Truffles and Dark Chocolate Stout Truffles, among others. Finally, bark is usually a slab of chocolate in which various ingredients are anchored. Peppermint bark is one familiar kind, but you must try the White Chocolate Strawberry Bark and the Milk Chocolate Peanut Butter Bark you'll find in this book. Get ready to satisfy your chocolate craving in yummy new ways! Hallie A. Baker started Turtle Alley Chocolates in 1999 with a tax refund, a most supportive husband, and a lot of luck. A dozen years later, she owns shops in Gloucester and Salem, Massachusetts. Turtle Alley Chocolates has appeared on NPR’s The Splendid Table, The Food Network, Roadfood, and Rachael Ray, and in Gourmet and Saveur.